I am starting this on the day it is due. I feel like I am back in high school again. 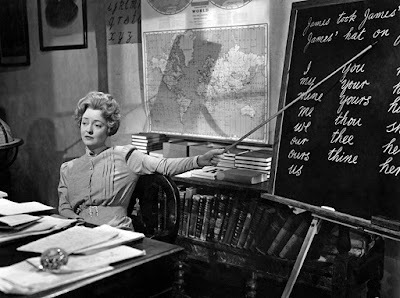 Anyway, I am going to admit this and some of you might be shocked by it, but I am not a big Bette Davis fan. But when I saw Crystal over at In The Good Old Days of Classic Hollywood was hosting an event, I knew I had my chance to give Bette another chance. I picked this film because of John Dall. I love John Dall and I wanted to check this film out because of him. But this blogathon isn't about John Dall, it's about Bette. 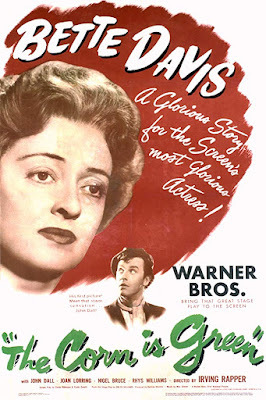 The film also stars Nigel Bruce, Arthur Shields, and Joan Lorring. Bette stars as Lily Moffatt, a woman who comes to a Welsh mining town and sets up a school. She is determined to give everyone in this town a good education. She doesn't have a lot of people on her side at first, especially after she is rude to the Squire (Bruce). At one point she thinks about throwing in the towel until she discovers a gifted student in one of her classes. Morgan Evans (Dall) is a miner and a heavy drinker, but she still wants to help him realize that he can be so much more than a miner. Morgan is doing his best and Lily is trying to get him into Oxford. However, one night after he gets into a fight with Lily and quits school, he runs into Bessie Watty (Lorring) and they end up sleeping together. Morgan comes back to Lily not long after that and asks for a second chance, She gives it to him and helps him study for Oxford examination. Everyone in town is rooting for him, hoping he does well and Lily is proud of her star student. But her dreams are crushed when Bessie comes and tells her that she is pregnant with Morgan's child. She blackmails Lily into helping her raise the baby, so Morgan will never find out. Lily agrees to adopt the baby and raise is as her own, since Bessie wants to marry another man and not raise the baby herself. Morgan catches wind of what is going on and says he will raise the baby himself. But Lily will hear none of it. She wants him to do good in the world, but she also tells him he must never come back. Morgan agrees and he leave for Oxford. I am not going to lie. I didn't go into this film with high expectations. But I have to say I was pleasantly surprised. I really enjoyed this movie! Everyone brought their A game on the acting front and I thought I would be bored, but I wasn't. John and Bette were the stand outs for me. The scenes they shared together were some of the best in the film. 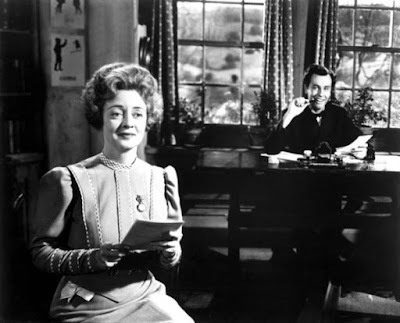 And this was John Dall's first movie role and her held his own against Bette. They were really fun to watch. Bessie was an annoying character, but I don't think she was meant to be seen any other way, honestly. The ending had me tearing up a little bit and it made me wish things could have been different for some of these characters. All in all, I enjoyed this film and I think you should check it out. This post was written for The Fourth Annual Bette Davis Blogathon. If you want to see the rest of the posts go here.